Ovila Belgian-Style Abbey Quad: Ale Brewed With Plums | Sierra Nevada Brewing Co. Poured from bottle into a glass chalice. Pours a dark brown leaning toward purple, almost like prune juice in its color. No detectable carbonation. 2 finger creamy head which dissipated after about 2 sips. Its appearance was by no means thick although no light made it through the glass. The aroma was of Belgian yeast. Bready, banana like. You can really pickup the prunes as well as other dark fruits, raisins, dry figs etc. The taste was delicious! Sweet malts, caramel, subtle prunes. The alcohol burn and spicy notes pleasantly balanced out the sweetness of the malts. Great aftertaste. The mouth feel was chewy yet not heavy. It coated the tongue but didn't linger. Overall this was a delicious beer. Not a true quad. Its characteristics were more akin to an English barleywine than a Belgian quad but it was delicious nonetheless. I just hate/love these collaborations between brewers because every so often they come up with a gem but it can only be had for a limited time, then you're left with the memories. I aged this one for 6 months. I think I'll age the remaining 4 bottles for 2 years and see what happens. Good US take on a Quad. Pours a dark brown color with a thin, cap-covering light tan head into my Chimay goblet. Good aroma of dark fruit (plums figs and raisins), sweet malt and Belgian yeast. Taste is good too. Dark fruit, sweet malt/molasses like, and some Belgian yeast. Not as complex as the best Belgian Quads but certainly rich and flavorful. Rich and smooth mouthfeel, with a very moderate warming alcohol presence. A great slow sipper/winter drink. A- Pours a very deep brown in color in the body. Slight hints of red are mixed into the body when held up to the light and the overall color impression is similar to a very deep colored, cherry hardwood. A small. 1cm head forms and hangs around for a good while and is beige in color. Lacing is very good as well. S- First impression of the smell is mush less fruity than expected, and much more roasty. Chocolate and medium toasted malts greet you right up front with a touch of the plums underneath. The end of the scent is more dark fruit forward than the beginning, but still predominantly malts. T- Starts off with the same dark and roasty malts as the scent, but moves into the plums more quickly than the scent. Chocolate and slightly burnt malts intermingle over top of the plums before the dark fruit flavor kicks in full strength. The fruit flavor dominates the middle of the drink before some burnt flavors come back at the end and linger a little after the drink. M- This beer is thick, smooth, and low in carbonation; it feels just like the liquid bread the style is intended to be. There is only a slight bitterness and warmth from the alcohol, but it remains dangerously smooth and easy to drink. Overall, this is a pleasant surprise. I was expecting a very fruit forward quad, but the dark and chocolate malts actually maintain a great balance with the fruit and provide a pretty awesome drinking experience. A: Dark brown with some ruby edges when held up to the light, tan colored head that quickly vanished, lots of tiny bubbles in the head, what's left of it, no lacing, not seeing any carbonation. A: Belgian yeast, plums coming through really nice, dark fruits, brown sugar, smells really dark and sweet, picking up some alcohol on the end. T: Classic Belgian yeast flavors quickly give way to plum, dark fruits, brown sugar sweetness, slight tart flavor at the end, plum sweetness lingers, not much alcohol for 10.2%. M: Medium mouthfeel, slight dry finish. A little thin, doesn't pop like a Belgian quad. O: I really like this, very balanced, it has that classic quad Belgian flavors but it is enhanced with a nice plum, dark fruit sweetness, warms up really well, alcohol is hidden pretty good, definitely going to pick up another four-pack. Appearance - Pours deep brown with ruby red highlights where light can penetrate with a tan half finger's worth of head. Fair retention, leading to a flat and barren surface with no lacing on the side. Very wine-like in appearance. Smell - Aroma hits on sweet, dark fruitiness and light sugary notes. Hints of astringency from the alcohol. Taste - Follows the nose. The plum comes through well with a predominant dark fruit character, along with some brown sugar sweetness. Touches of alcohol in there, but doesn't get too hot. Very wine-like in the finish, with plum, black cherry fruit and dark chocolate in the mix. Mouthfeel - Full in body with light carbonation. Not quite as chewy as some quads. Drying finish. Overall - Good brew. Drinks similarly to red wine; like a cab or zin with a touch of carbonation. Maybe not the best or most complex quad out there, but certainly unique. I wouldn't be opposed to drinking it again. Wow, this is one of the best values in the craft beer world. This pours a dark brown almost black, but when held up to light you see deep red shine through. Smells sweet, bready and slightly spicy. Taste is a huge blast of brown sugar, dark fruit and sugary spiced banana bread. Very sweet, which could be toned down a bit. As it warms you get more roasted malt and some licorice, as the sweetness dies down slightly. Very warming with, lower carbonation which helps it achieve a medium-heavy mouthfeel. Delicious, high value beer. If the sweetness was turned down a smidge so that the other flavors could shine through a little more - it would be one of my top big Belgians I have had (which is not a ton). 10oz pour into a brandy snifter at TJ's Restaurant and Drinkery in Paoli, PA. Dark brown/ruby with garnet highlights at the edges of the glass. There's an off-white collar around the glass when it's brought to the table. No lace, as expected. Dark fruits galore, along with sweet and biscuity malts and a touch of brown sugar in the nose. The sugar plum is definitely discernible and lends an added sweetness. The sugar plum is also apparent in the taste, and imparts a slight acidity that is almost (but not quite) tart. Prunes, rum-soaked raisins, figs, toffee, brown sugar, sweet caramel malt and pumpernickel bread. Finishes with a touch of earthy hops. Medium to full body, slightly slick with a dry finish. Some alcohol heat is noticeable but not overbearing. Low carbonation fitting for the style. The sugar plums don't make this a new beer, but it's a nice addition in an already super solid quad. The plums add a nice acidity that cuts through the heavy maltiness and provides depth. A great after dinner/desert beer, and a great quad all around. Definitely recommended for fans of the style. A: I suppose I did not pour this with enough vigor but the head promised was not present at all. pours jet black and glossy. Darker than motor oil. S: Kind of weak honestly, I was rather unimpressed, this beer was poured into a bernardus glass but I would recommend a snifter, should focus the release of the smell more so it is present for longer. Sweet and fruity, a tad malty I think but it dissipated so quickly I could not really tell. As the beer sits though the sweetness in the nose does become more pronounced. Tinge of oatiness to the taste as well. T:Roasted malt marries nicely with the plum, a tad bitter at times and though the bitterness is not exactly a plus it's also not bitter enough to be off-putting. For a beer this conspicuously alcoholic, it is well enough masked, present just enough to encourage slow enjoyment but masked enough to all it to be enjoyed. Any prominent spicy character is mostly overwhelmed by the roasted malt, it's still there just kind of pushed back. M: Sticky sweet, standard, no complaints. O:This is a pleasant, albeit somewhat strange beer and I would say that serving it just to the left of cold would work just as well as serving it cold. It leaves a warm burn in the stomach and a sweet taste on the tongue, if this is to be your first foray into quad territory better go with St. Bernardus Abt. 12 instead, there really is no good place to start with this kind of beer so that is as good as any. this is good beer and an interesting beer, take time to enjoy it and the experience will be better for you. Amazing beer. The smell is hypnotizing. Taste is even better. First Quad. I've had a number of Dubel and Tripel styles in the past, but never a Quad. Poured the bottle into a snifter style glass for enjoyment. Immediately, you'll notice how dark it is. This surprised me, being my first Quad I assumed it would be lighter like the lesser Belgians I've previously experienced. It's quite balanced, though shows little emphasis on the plums apart from the subtle sweetness you can find, but only when specifically searching for it. Hides the hefty 10.2% alcohol well. Overall, it's a well balanced and highly drinkable Quad (and affordable! Only set me back $3.50 or so, out the door for a single bottle!) This is something I look forward to seeing on the shelves again! Poured into a Westy chalice a very nice grapey color, very nice carbonation, with a very nice one-finger creamy off-white head, with some very nice thick sticky lacing with some nice big oil slicks. The nose is malty, with some nice yeast notes, plums, grapes, raisins, figs. The taste is malty, yeasty, with lot's of dark fruits. Medium body, ABV is hidden very well with this one. Overall a pleasure to drink, surprised to see this one in Utah. 375 ml caged and corked bottle. Served in a Unibroue tulip, the beer pours a dark cola brown color with a half inch light tan head. Head retention and lacing are both decent enough. The brew smells like plums, cherries, bready malt and a bit of molasses. It tastes like plums, bready malt, cloves, toffee, and some bananas, chocolate, and a slight medicinal taste. Mouthfeel/body is medium, it's a bit creamy and coating with a good amount of carbonation. I think it's a good brew overall, but with that being said it's not one of the best Quads I've tried. Still, it's certainly worth trying. $3.79 for a single bottle. 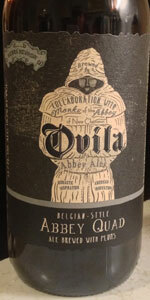 Ovila Belgian-Style Abbey Quad: Ale Brewed With Plums from Sierra Nevada Brewing Co.